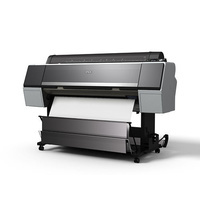 The SureColor Production 10070 is a 44" (1,118mm) Large Format Printer that is designed for medium-high volume graphic, fine art and poster printing. 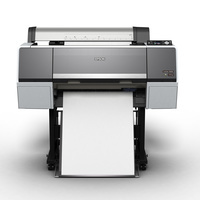 It supports a wide range of roll and sheet based media and features an all new PrecisionCore MicroTFP print head with Variable Sized Droplet Technology™ for output with superior resolution, gradations and colour density. 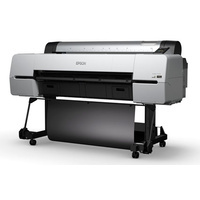 It uses Epson UltraChrome® Pro all-pigment aqueous ink for quality colour and premium B&W output that is consistent, predictable and durable. 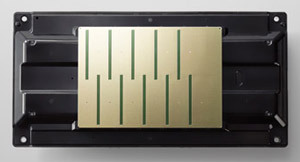 The SC-P 10070 Cartridges feature an extra-large capacity for extended operation with a low cost per print due to the new PrecisionCore printhead and reduced running costs. 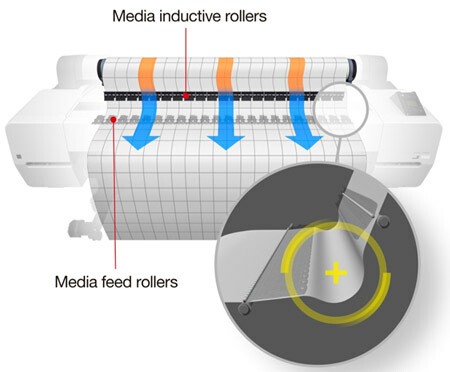 The printer ships with an output bin for cut sheets as well as an optional Auto-Take-Up system for continuous roll to roll production. Flexible Operation – supports a wide range of media with fast print speeds. Handles roll based stock up to 44" (1,118mm) wide and sheets up to Super B0. Supports board stocks up to 1.5mm thick, can print edge-to-edge and full borderless, supported by the new media feeding system. Easy to Use – 2.7" Colour LCD control panel with integrated help as well as high visibility individual ink indicator lights. Spindle based roll media loading with adjustable tension, auto media management system and a heavy duty auto cutter. 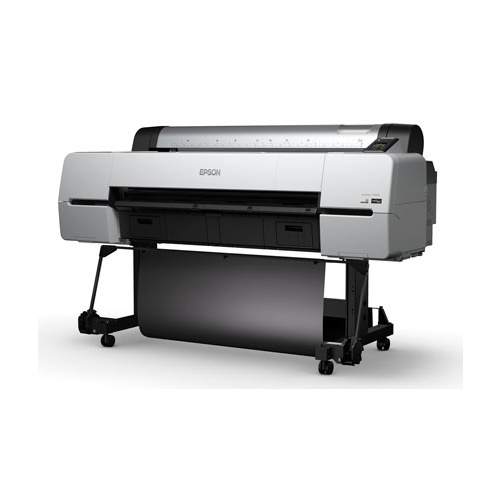 The SureColor Production series features Epson's patented PrecisionCore Micro TFP head technology with a 2400x1200dpi resolution. 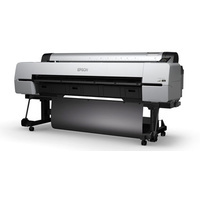 Unlike competing mechanisms that are based on heat, the Epson print head uses an electro-mechanical movement that is kinder to the ink chemistry, for better imaging with more stable output. While consuming less power and less ink, it is also more accurate, flexible and durable. Micro-fine drop-on-demand nozzles enable precise dot shaping, placement and volume/density control for more consistent results with less wastage. 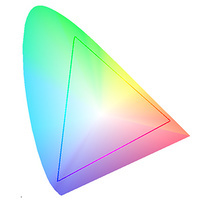 Variable-size Droplet Technology (VSDT) enables superior half-tones and optimised colour density with minimum ink consumption. Ten active channels are driven by an advanced LUT (Look-Up-Table) and a 10 cartridge ink supply system to provide an enhanced colour range. Dedicated Matte / Photo Black ink lines ensures the maximum possible dynamic range is achieved on a wide variety of media types and there is no extra ink wastage. Self-monitoring, alignment and cleaning systems ensure predictable, consistent and reliable output with minimal user maintenance. The SureColor P10070 is a floor-standing printer with a 44" (1,118mm) wide carriage and improved flexible media handling. It supports basic bond paper, photo and fine-art paper, transparent film, translucent back-lit, canvas and specialist synthetic media. It accepts roll media via a spindle mounting with integrated tension adjustment and has a high-speed auto-cutter which will cut most stocks including canvas. The printer ships with one spindle that supports rolls with either 2" or 3" cores. Additional spindles can be ordered separately for environments that involve high volume work with multiple media types. An integrated barcoding system helps track individual roll consumption while also enabling rapid exchange with automatic re-configuration for different media types. The printer supports sheet media and has a straight through paper path for solid board. It comes with a retractable output basket as well as an optional Auto Take-Up system for roll-to-roll printing and off-line / automated post-production. The ATU supports forward and reverse winding to enable de-curling. The printer supports edge-to-edge printing on sheet and roll media and will print full borderless on roll stocks. 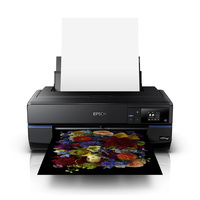 ** Service and support is provided for product supplied through Epson Australia or Epson New Zealand. 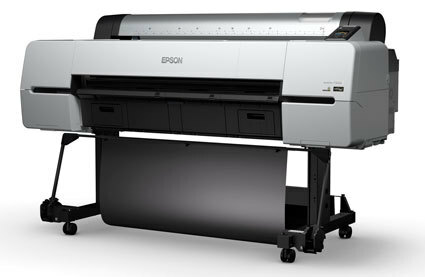 This facility is provided in conjunction with the Epson Authorised Large Format Reseller network. Limitations apply to the provision of on-site service. Regional locations and certain installation situations may attract additional charges. Service may be restricted or limited when equipment is used outside of specification &/or with non-Epson consumables. 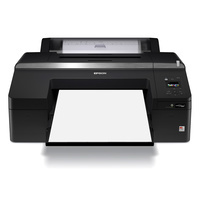 Printers ship with a comprehensive twelve month on-site warranty. 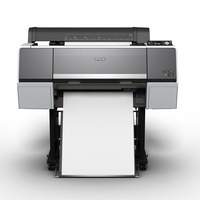 Parts and labour coverage can be extended using one or more Epson CoverPlus 1 and 2 year packages up to a total maximum total of 5 years (including the initial 12 months). All cover is conditional with customers directed to read our warranty terms prior to Purchase. + The system only works with Epson genuine media. It does not operate with board, film, media with a textured back surface, or media with substantial tendencies for cockling or shrinkage. Figures represent print times on Plain and Premium Photo(*) paper. Print speeds are engine only with total throughput time dependant on workflow configuration, paper type, software, file format / size, print resolution, ink coverage, networking, and other factors. ** CoverPlus Service Packs enable basic warranty cover to be extended. One or more Service Packs can be ordered in conjunction with the various printer configurations &/or options to enable cover for 1, 2, 3, 4 and 5 year periods (total cover cannot exceed 5 years). 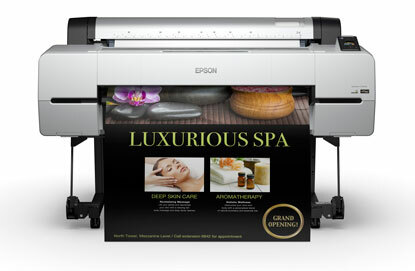 Service and support is only provided for product supplied through Epson Australia or Epson New Zealand. This facility is provided in conjunction with the Authorised Large Format Reseller through which the product is ordered. Limitations apply to the provision of warranty upgrades and on-site service. Regional locations and certain installation situations may attract additional charges. Service may be restricted or limited when equipment is used outside of specification &/or with non-Epson consumables. 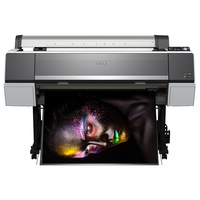 For full details on coverage, terms and limitations please review the warranty terms listed on this web-site and contact Epson or one of our Authorised Large Format Resellers if you have questions or concerns. 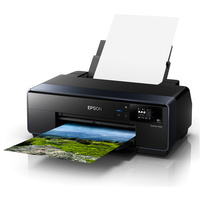 Epson Australia warrants that your Product will be free from any defect in materials or workmanship for one (1) year (or, in case of a Factory Second, for six (6) months months unless otherwise advised by Epson) after your Purchase Date. Epson Australia Pty Limited will perform Onsite Express Warranty repair work within an 80 kilometre radius from its nearest service centre, in the following areas; Sydney, NSW Central Coast, Newcastle, Wollongong, Canberra, Melbourne, Hobart, Launceston, Brisbane, Adelaide, Perth, and Wagga Wagga.